Okay! Let’s real quick talk about meal planning for Sugar Free January. 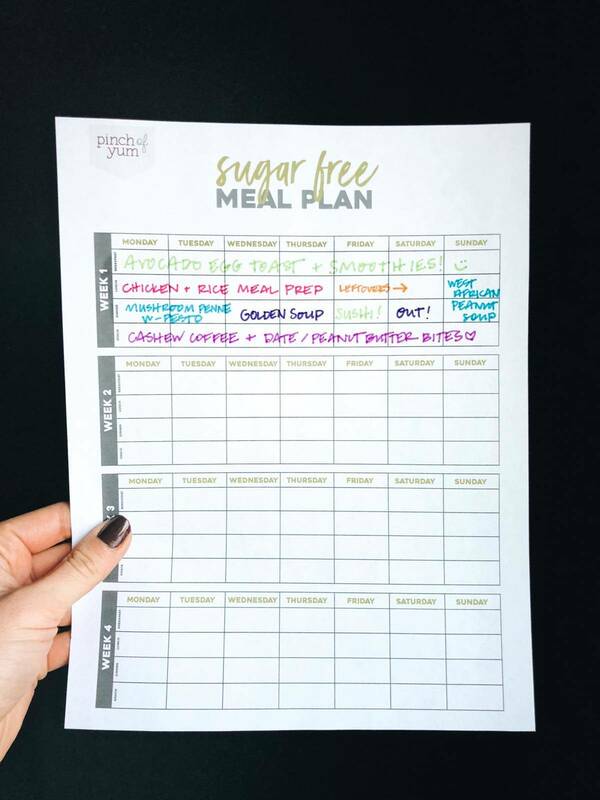 We aren’t going to do major meal plans during Sugar Free January but we ARE giving you a free printable template to make your weekly/monthly planning super easy. And we are LOADING YOU UP ON RECIPES so you have lots of yummy things to choose from as you decide what you want to eat this month. Click here to download the Sugar Free Meal Plan Template. I will also be making a weekly batch of Sunshine Sauce for Sugar Free January. And here’s what my grocery list looks like for that first week’s plan. I take this list and then either add it into my grocery app (we use Grocery IQ) or place an order for grocery delivery service, which is the best thing to ever make its way into our modern lives (we use Instacart). Once you add your groceries into the app, they will be organized by category, which makes shopping really easy. Here are a few other lil’ tipsters for meal planning during Sugar Free January. You don’t have to have something different every day. Batch your easy meals, like breakfast and lunch. In my example plan, I will just be eating avocado toast, and/or a smoothie, and chicken and rice meal prep for the majority of the week’s breakfasts and lunches. I don’t mind eating the same food a few days in a row as long as it’s really, really good. And I might change up some small things, like one day I might do a cheesy version of scrambled eggs on avocado toast, and one day I might just do avocado toast with a sprinkle of red pepper flakes, and one day just spicy scrambled eggs. But knowing I’ll have avocado egg toast (or some combo of that) helps me keep my shopping list short and my brain space available to think about other things. Leave space for leftovers and eating out. If I make one pasta recipe that serves 6-8 people, and there’s only 2 of us… we should be able to eat that 3-4 times. Leave space for your leftovers, and for your weekend social gatherings with friends. It’s hard to order out when eating sugar free which is why I’m only writing in 1-2 spaces for eating out on this meal plan, but it’s doable. And I think getting out of your house to share a meal at a restaurant with friends, even if you’re just ordering a simple grilled chicken and veg entree and a glass of red wine, is important for your social/emotional health. Limit to one fancy or new recipe per week. The only recipe on my list this week that requires more than one pan to make is the mushroom penne. I definitely don’t recommend choosing one all-new, full-on homemade recipe every night of the week. Make big batches of stuff! Eat your leftovers! At MOST, in our “real life,” I cook three recipes per week – maybe one on Monday, one on Wednesday, and one on the weekend to prepare for the week ahead. Keep it simple. Okay, the last thing I’m going to leave you with is a nice long list of recipes that I think would be good to consider for your meal planning purposes – either breakfasts, lunches, or dinners. This should give the high-achieving super-planners in the group a highly prepared starting point for #POYsugarfreejanuary! I am so excited to start sharing these recipes with you! THREE MORE DAYYYS. Soft-Scrambled Eggs – A MUST-MAKE! Cashew Coffee – Also a creamy, dreamy favorite. One of the most popular recipes on POY! Simple Poached Egg and Avocado Toast – What I’ll be making for breakfast all week! Simple Green Smoothie – I make variations of this all the time. Currently I’m making it with frozen mango (instead of banana) and kale (instead of spinach). Yum! Golden Soup – A personal favorite, and a crowd favorite! Spicy Peanut Soba Noodle Salad – YES THIS IS AS GOOD AS IT SOUNDS. Spicy Chicken Sweet Potato Meal Prep – This concept works with just about any grain / protein! And it’s perfect for the Instant Pot. Mediterranean Quinoa Bowls – So yummy for meal prep! 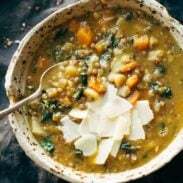 Creamy Potato Kale Soup – Super crazy green color but one of our absolute FAVORITES. 5-Ingredient Green Curry – A winter essential. 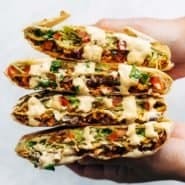 Cauliflower Walnut Taco Meat – SUPER versatile and would be great for meal prep, too. Baked Salmon with Lentils – Sounds really healthy because it is. Also: SO DELICIOUS. Healing Bowls – These have turmeric mashed sweet potatoes so YES. Get on it. Spicy Shrimp Tacos with Garlic Cilantro Slaw – Do it for the slaw. Honey Ginger Tofu and Veggie Stir Fry – NEEDED in your life. Salted Chocolate Snack Bars – refined sugar free! Magic Green Sauce – 24/7/365. 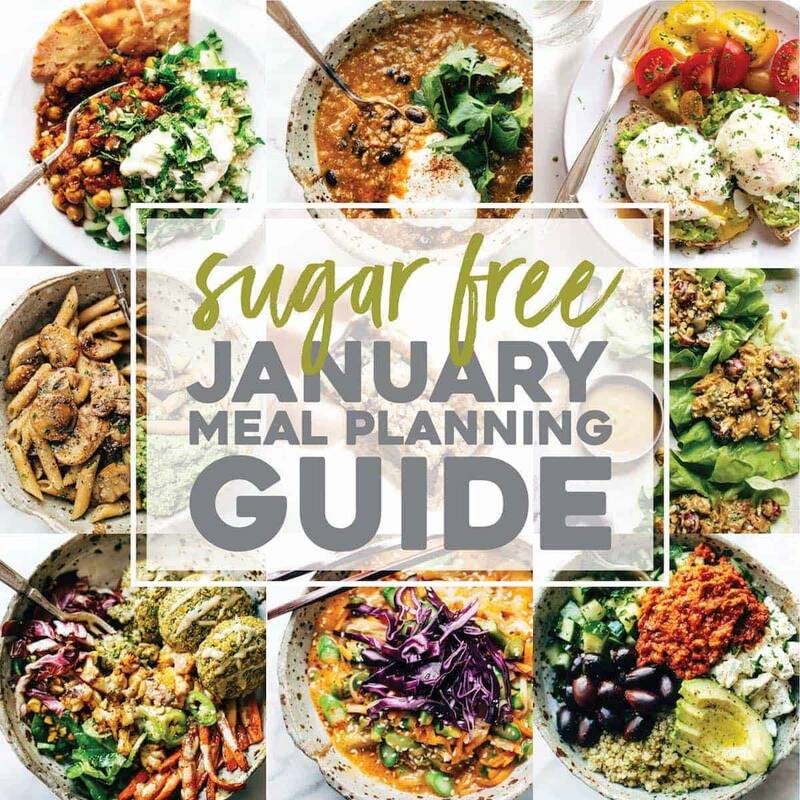 You can look through our sugar free category of recipes here, and you can click here to download the Sugar Free Meal Plan template! #POYsugarfreeJanuary — we’re comin for ya! See you guys in January!